The army began cordoning our office premises at around 9:30 (0445GMT) in the morning, some half an hour ahead of the Royal Proclamation… the state-owned radio and television had already announced that King Gyanendra was going to address the nation. Nothing more than that had been said, except that the King had summoned the then Prime Minister Sher Bahadur Deuba and chiefs of security agencies for a Royal audience. As the group of armymen covered the periphery of the premises, an army major, in his military outfit and a gun, asked for an entry into the television station’s newsroom. He politely said that he was here to provide security to the office in case an incident like September 1 occurs (On Sept 1, following the killing of 12 Nepalis in Iraq, there were riots in the city…the rioters had vandalized the office, burning several vehicles and pelting stones on the office building). All of us, almost the entire news team, watched the Royal Proclamation live on the state owned television. Following the proclamation, the army major asked whether he could visit the control room. By then, the telephone lines were already cut and the cellular phones were cut during the address to the nation itself. He was promptly shown the studio and news control room of the television station. A lot of confusion had already been created with the announcement of emergency, following the sacking of the then government. A lot of fundamental rights were suspended with the announcement. cordoned the premises throughout the night. were removed in our subsequent bulletins. The same day, we had aired an international news, which had it that the Marxist guerrillas had killed 14 Colombian marines, in Colombia. We ran the news in three of our bulletins, starting in the morning. The army major, very polite in his conversations, requested to remove that news as well. The reason: that could be detrimental to our security forces’ morale. The word communist had its effect. The armymen stayed within the premises for three days and the screening went on a regular basis. One of our bulletins had to be aired two minutes late, because the Major had not finished reading the news then. On the third evening, the army left. But before leaving, they cautioned us to follow the guidelines issued by the government while disseminating news. And we have been following that ever since. This article, written by yours truly, was published on Radio Free Nepal, an online blog, where articles were published anonymously, following takeover of Executive powers by then King Gyanendra. 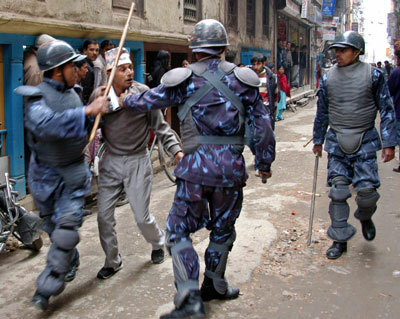 This article appeared under the headline: An Account from Kantipur TV News Staff on Censoring, on February 19, 2005. The reason it has been re-posted here is to remind us, what we have braved in past, so that we do not lose the achievements of Jana Andolan II. Dashain in Secular Nepal ! A sign of Good Times to come? Promise’s there: Time to Act!